The uniportal VATS technique is definitely a significant breakthrough in the field of minimally invasive thoracic surgery. In addition to the reduction of surgical trauma by reducing the number and the size of the incisions, the direct vision provided by the uniportal technique [1, 2], which coincides with the movement of the instruments in the same direction, and decrease the post operative pain and complications are the strongest factors in the success of this technique [3, 4]. This may have convinced many surgeons to adopt and practice the technique as a standard. There is no doubt that the subxiphoid technique is a further addition to the technology of uniportal VATS , which aims to reduce the surgical trauma more and more by entering the thoracic cavity through a nerve free zone, which may reduce the likelihood of chronic pain after the operation to nearly zero. The idea of employing the subxiphoid incision as an additional accessory incision was found more than two decades ago in approaching the thymomas and anterior mediastinal tumors [6, 7]. 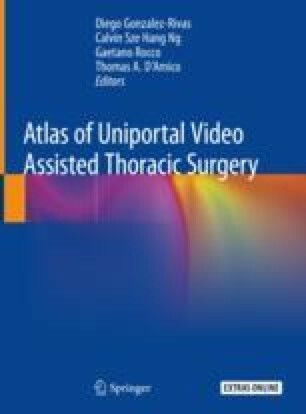 Since the first report on anatomical pulmonary resection through the uniportal subxiphoid approach in 2014 , some papers that describe the technique began to appear [9–12]. However this technique is still fresh, and all the reasonable theories which assume the odds of this technique are still needed to be evidence supported by randomized studies and scientific comparisons. The online version of this chapter ( https://doi.org/10.1007/978-981-13-2604-2_36) contains supplementary material, which is available to authorized users.